Eight years ago, the dozen Pac-12 universities all became Green Sports Alliance members — the conference’s student-athletes, coaches and sports fans agreeing to support and prioritize campus and game-day sustainability initiatives under a new organizational umbrella. Pac-12 Team Green helps promote the “greening and sustainability efforts taking place on and around the Pac-12 Conference and all 12 of its member universities,” according to Pac-12’s website. No more single-use plastic cups finding their way into trash cans, for example, and no more water-intensive sports fields. During the past four football and basketball seasons, every Pac-12 campus has been competing with one another to produce at least one zero-waste home game. Among different categories — which include an overall winner, best fan-engagement, most-improved and best student-athlete engagement — the Pac-12 recently announced University of Colorado Boulder as the overall 2018-19 Zero Waste champions. CU’s big sustainability win this season was a natural progression. During the 2016-17 football season, CU placed third among Pac-12 Green Sports Alliance members with a waste-diversion rate of 87 percent. That same basketball season, however, CU placed an encouraging second, boasting a waste-diversion rate of 92 percent at one home game. The following year, during the 2017-18 football season, CU won the Athlete/Player Engagement Award. Ralphie’s Green Stampede, the nation’s first NCAA Division I sustainable athletics program, played a large role in reaching this Pac-12-inspired goal at CU. Ralphie’s Green Stampede has implemented or installed zero-waste programs across all of the university’s sports venues, zero-net carbon emissions and zero-net water use in all facilities, a zero-net-energy football practice facility and a zero-waste car-free tailgating zone. CU also collects plastic bags from stadium activities and sends them to a recycler that manufactures new plastic bags for collecting tailgate recycling on game days. 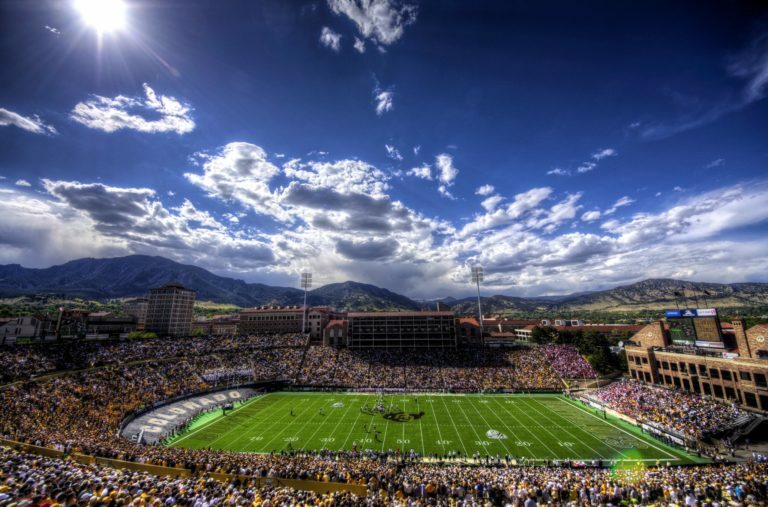 The home game on which CU’s sustainability win was based took place on Oct. 6, 2018 against Arizona State. The fact that it came on top of an athletic win made it that much sweeter. In a close game, CU defeated Arizona 28 -21. More importantly, however, a 91.82 percent diversion rate was achieved that day — more than 8,700 pounds of waste were composted; more than 3,900 pounds of bottles and cans were recycled; and just over 1,300 pounds of waste were sent to a landfill.